Everyone loves a good PB&J sandwich. The creamy peanut butter swirled in between bites of sweet jam brings me back to my childhood lunches. It was the quintessential lunch and even as a adult, the ultimate comfort food. Instead of using two pieces of bread, this recipe transforms this old favorite into a muffin. Mixing the peanut butter into the batter distributes the peanutty flavor throughout the entire muffin, so each bite is just as decadent as the last. Don’t worry if some of the jam comes oozing out after baking, nobody said baking was pretty, but the end result will be just as sweet. 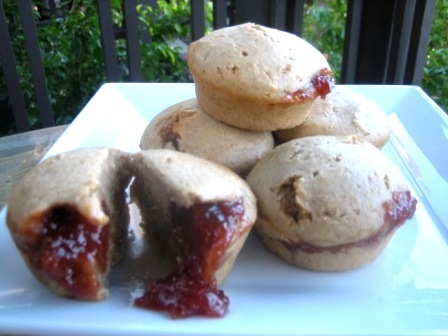 These little muffins make the perfect snack or breakfast, better yet, smear some nutella on top and you have dessert too. Experiment with different nut butters and jams or use a seaonal ingredient like pumpkin butter or apple jam. (Check your local Trader Joe’s or Whole Foods for specialty nut butters). Almond butter with blackberry jam? Hazelnut butter with apricot? The possibilities are endless. These are great served piping hot out of the oven or cooled. Either way, you can’t go wrong with this recipe. Yum. I am all about these!